Dice Masters only launched fairly recently, but the game has already managed to garner a decent following. I was hooked as soon as I tried it, and by that point there were already two sets available for purchase. From WizKids, the same people behind the collectible miniatures game Heroclix, Dice Masters features characters from Marvel, DC, Dungeons and Dragons, and Yu-Gi-Oh so far. But I know what you’re thinking: what exactly is Dice Masters, and why am I talking about it? Well, let’s discuss this, because it’s high time more people knew about this excellent game. My focus will be on the newest set, DC’s War of Light, but it helps if you know what the game is first. Let’s start with the basics. Each player has a bag full of basic dice, as well as some cards and connected dice depicting characters in front of them. At the beginning of a player’s turn, they draw four dice from the bag and roll them. The basic dice may come up as Energy symbols, or as small generic characters. Dice showing energy symbols can be used to buy Character dice from the cards you have in front of you, which go to your Used pile along with the dice you spent to get them. Characters can be “fielded,” allowing for combat. Each Character has values for Attack and Defense, along with other abilities, and combat is very similar to games like Magic: The Gathering. Finally, if you start your turn with fewer than 4 dice in your bag, you put everything from your Used pile (dice you’ve used and ones that you’ve bought) and put them into the bag, continuing to draw until you have 4. The character dice work just like the Basic dice, but are obviously more powerful. That’s a lot to take in, I know, but if you’re familiar with some other games it’s probably starting to sound somewhat familiar. It’s quite similar to deck building games like Ascension; you’re just building a bag full of dice instead of a deck of cards. And if you’ve played WizKids’s other “dice building game,” Quarriors, this is like a collectible version of that. There’s more to the rules than what I described, but that should hopefully give you a basic idea of how it plays. As for getting your hands on the game pieces, I can happily report that it’s significantly cheaper than most collectible games. The starter boxes cost around $20 and contain everything you need for two players to get started. Booster packs each contain two dice and the related cards, and cost $1. I recommend it to anyone; there’s something to be said about using tangible 3D objects in a game, and it’s pretty easy to pick up once you learn the rules. That doesn’t mean it’s an easy game, as it’s quite hard to master (no pun intended), but it’s a lot of fun even when you’re still learning. The wide variety of characters available means that you’re bound to find a squad full of your favorites. For example, I like to use Deadpool, The Flash, Exodia (from Yu-Gi-Oh), and a Mindflayer (from D&D). Each character has unique abilities that, when done right, reflect the character well. Now that we’ve covered the basics, let’s discuss War of Light. The set is based on Blackest Night, a crossover event that had the Green Lantern Corps join the other colored Lantern Corps against the undead Black Lanterns, reanimated versions of dead super heroes. In addition to introducing new characters for each Lantern Corps, it gave power rings to characters like The Flash, Lex Luthor, Batman, Scarecrow, Wonder Woman, and Supergirl to name a few. It’s these characters, and these forms of characters, who show up in the set. That means that there are a few characters repeated from the previous DC set, but they’re brand new versions. WizKids has done an excellent job of matching the characters’ abilities, based on the comics. For example, some Blue Lantern characters are less powerful when you don’t have a Green Lantern fielded with them, but are extremely powerful when you do. There are non-lantern characters represented here too, including the debuts of some Teen Titans characters. It’s also worth noting that, especially if you like the aesthetics of War of Light in general, the dice look very cool. Some are translucent, some are shiny, and some are just matte and opaque, but they all look cool and come in colors that match the characters. One last thing to note about the set: with a game as young as Dice Masters, there’s always some concern of power creep or power seep; that is, as the game’s developers settle into the ideal power level for the game, you may find that newer cards and dice are significantly more or less powerful than previous ones. I’m happy to report, though, that this is not an issue for War of Light. The power level matches the previous DC set, Justice League, perfectly. And while there are some differences in mechanics and terminology, all Dice Masters sets work together. That means you can use War of Light with not just the Justice League set, but also the non-DC sets. Again, it’s not to the extent of Heroclix (which by my count has more than 10 distinct licenses), but it’s a good mix, and it lets you answer the age old question of who would win in a fight between Ant Man and The Atom. 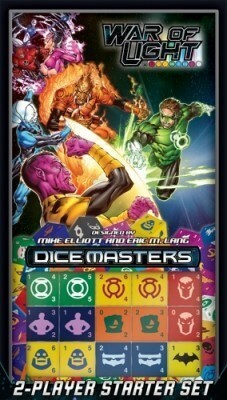 Ultimately, Dice Masters is a great game that’s easy to pick up, hard to master, and fun to collect. If you haven’t tried it yet, and you enjoy trading card games or deck building games, pick up one of the starter sets and give it a try. If you already play, I highly recommend the War of Light set. It introduces some seriously cool characters to the game, while reinventing others, and the mechanics fit the characters perfectly. These are some of DC’s best heroes and villains, and the theme really ties the set together. Everything is compatible and balanced with the Justice League set and the non-DC sets, so it’s a great addition to an already vast game. For now, I’m just hoping we see some sets based on video games.